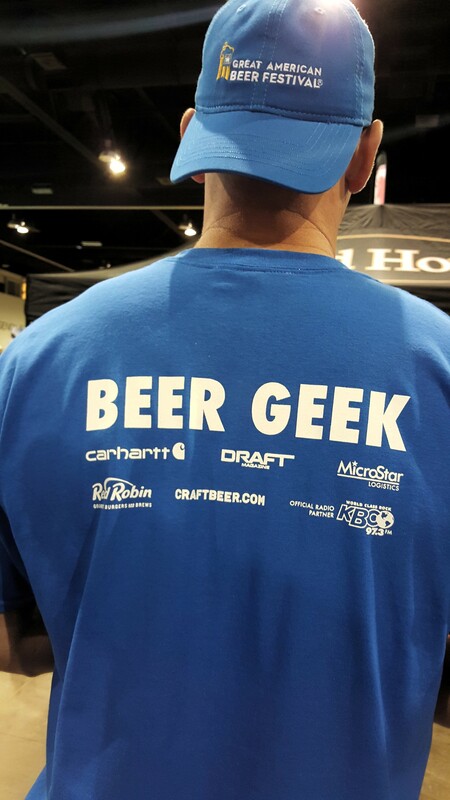 EDB Spirit Awards of GABF 2015 – Now with BEER GEEKS! Yes, beer is important, but presentation also counts when your booth is just one of about 750 others. In the spirit of spirit – our first award – Most Spirited Brewery goes to Odd13 Brewing. 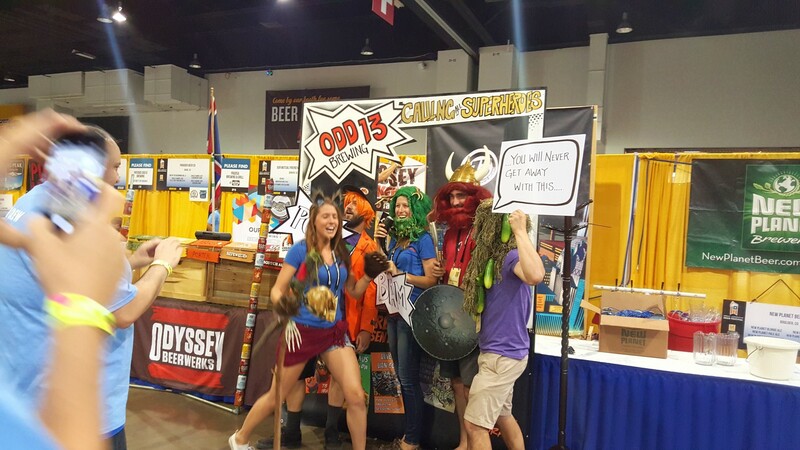 Their comic-inspired pop art booth stood out in the sea of convention booths, making the most of their small space and grabbing the attention of beer enthusiasts from around the globe. They came for the booth, but stayed for the beer. Congrats to Odd13 Brewing! My pick for Crowd Favorite goes to Liquid Mechanics’ Peanut Butter Porter. I can’t count how many times I heard the phrase “Peanut Butter Porter” in the three days I was there, but it was a ‘blank’-ton. Congrats Liquid Mechanics! Next, a word on festival-goers – hats off to you, my fellow beer brethren – you make all of the lines worth waiting in; your enthusiasm is contagious; your knowledge is infectious; your passion is fab-beer-ific – if that is a thing. 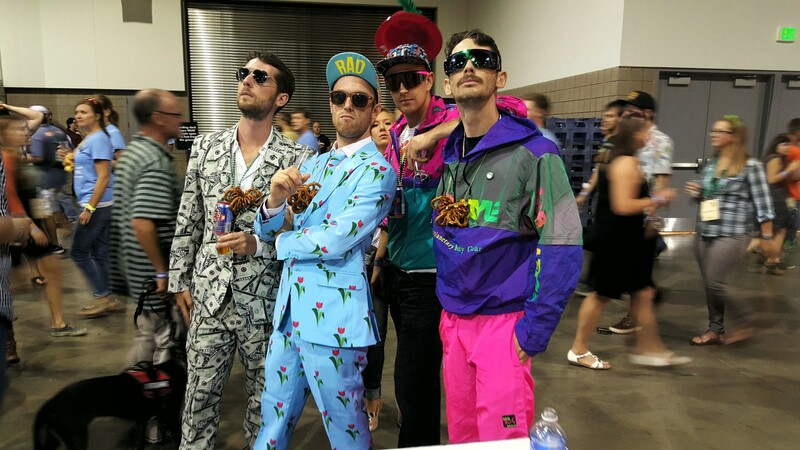 My award for Fashion on Fleek goes to “Da Boyz of GABF” – sorry guys I didn’t get your names, all I know is one of you is from Boulder and you represented @ShinestyThreads in a totally non-basic way. (That’s a real phrase the kids use these days according to Urban Dictionary). Finally, a very personal award goes to Luckiest Volunteers at GABF, which goes to the GABF Beer Geeks program, which I was fortunate enough to participate in. Being an official GAFB Beer Geek, my job was to talk to people about beer for three days. You see, I attended the festival as a volunteer whose only responsibility was to interact with guests, sample and recommend beers, while not getting too inebriated in the process. The best part ? I got to attend for free! No worrying about sell outs, or waiting in line to get in for us – Beer Geeks are a special set of volunteers who work under the Brewers Association (with a superhuman named Tom Nachman in charge of the whole thing), in order to help some of the 60,000 attendees navigate the overwhelming halls to seek out their favorite beers, or to find their “rabbit holes” so to speak – those hard to find pub rarities like Deschutes Brewery’s Smoked Gose – or Samuel Adams’ Utopias. My personal rabbit hole started with Snake River Brewing Co.’s (Jackson, WY) Le Serpent Framboise – it was the best framboise I’ve ever had. It is described as a Flanders style sour ale, aged in oak barrels for over a year, and has won numerous times at GABF including gold in 2010. Later in the evening I sampled Platt Park Brewing Co.’s (Denver) Watermelon sour. It was powerfully watermelon and sourly spectacular. I hear many folks reeling over how fabulous this watermelon sour was (I feel like I helped spread the word a bit). Finally, ending my 3-session GABF experience I decided to try something unordinary, so feeding on the crowd’s quest for chili beer, I stumbled upon a Ghost Chili Golden Ale from El Toro Brewing Co. (Morgan Hill, CA). It was powerfully spicy and amazingly smooth. I went in for seconds, and then immediately cooled off with Anchor Brewing Co.’s (San Francisco, CA) Meyer Lemon Lager. The lemon flavor immediately attacked my burning palate, and I felt like I had earned my wings as a certified craft beer enthusiast. Cheers! Me: What did you just try? Patron: I tried Odd13’s Humulus Kalecumber…It has kale in it? Me: Yes, they’re crazy! But in a good way. I’m pretty sure it’s the only kale beer here, but you never know! (With more than 3,700 beers flowing in the convention center, it’s kinda hard to keep track.) Thankfully, GABF has an amazing app that lets you search by brewery, state, style or – if you want to go there – kale. After searching the app – Yes, Odd13 Brewing is the only result that shows up for kale. Glad we sorted that out! So, next time you are at GABF and you swear you told your husband to meet you at 2:30 by a sign on a wall (but you can’t remember what the sign said or which wall you were looking at), find a Beer Geek and thank them for volunteering! You won’t regret it. We promise. Until next year, GABF, it’s been supercalifragilistic-Awesomesauce-spectacular!